If the great Sir Bobby Charlton describes you as the most complete footballer he has ever seen, you're destined for greatness. Of course, he was far from the only one to be entranced by the supremely talented Alfredo Di Stéfano, nicked "The Blond Arrow". While not as flashy or technically gifted as some of his contemporaries, Di Stéfano's incredible versatility, stunning physical predispositions and leadership skills made him into one of the best players the game has ever seen. For his on-field achievements, Di Stéfano won two Ballon d'Or awards in 1957 and 1959, as well as the first and only Super Ballon d'Or in 1989. Di Stéfano was born in Buenos Aires, in 1926. While he began his senior career at River Plate, Di Stéfano did not get into the first team right away. He started making his mark on a loan to Atlético Huracán, where he scored 10 goals in 25 appearances before returning to River Plate. The year of 1947 was doubly important for the young Di Stéfano: in addition to helping River Plate to a Primera title, he made his international debut by playing for Argentina at Copa América. In what would be his only six games for the Argentinian national team, he scored six goals and played a crucial part in Argentina winning their ninth title in the competition. Following a general strike in 1949, Di Stéfano joined many of his colleagues and left River Plate and Argentinian football. In the expose over Argentinian football, Angels with Dirty Faces, the author Jonathan Wilson asserts that "The probability is that had it not been for the strike, he would have established himself as one of the great stars of River and Argentina". Di Stéfano opted to continue his career in the Colombian league, which was outside of FIFA's jurisdiction at the time, and thus able to offer huge wages to players they deemed worthy. He spent the next four years with Millonarios of Bogotá, winning three League titles in that period. He also played four games for the Colombian national team, even though FIFA has refused to acknowledge them to this day. In 1953, Colombia rejoined FIFA and Di Stéfano was once again left without a club. By this point in his career, he was a bonafide superstar, whose hair color and explosive speed have earned him a nickname "Saeta Rubia" ("The Blonde Arrow"). 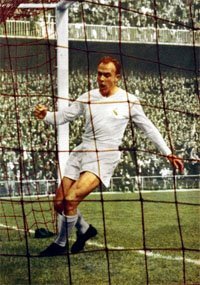 Following a complicated bidding war for his services between Real Madrid and Barcelona, Di Stéfano joined Real in 1953. In a classic "the rich get richer" scenario, the addition of Di Stéfano turned Real into the most dominant club of its era, and possibly of all time. Along with other superstars such as Ferenc Puskás and Francisco Gento, Di Stéfano led Real to eight La Liga titles between 1953 and 1964. Soon enough, the club's dominance spread to Europe. Starting with the inaugural competition in 1955 and up until 1960, Real Madrid made five consecutive European Cup finals, winning them all without much resistance. Di Stéfano made history by scoring in each of the five finals, thus establishing himself as the de facto leader of the greatest team in the world. In 1957 and 1959, he was named the European Footballer of the Year. In 1963, his life took a turn for the worse when he was kidnapped at gunpoint by a Venezuelan revolutionary group; however, he was released two days later. He opted to play in an exhibition match the very next day, receiving standing ovations from the crowd. He continued to win trophies as a manager, most notably with Boca Juniors, River Plate, Sporting and Valencia. In 1989, he became the only player in football history to be presented with the Super Ballon d'Or. In 2004, he was voted the fourth greatest football player of all time. He died of a heart attack in 2014, at the age of 88.